Thomas MacEntee has a brand new book out to compliment his most-watched webinar, My Genealogy DO-Over - A Year of Learning from Research Mistakes. Read all about it below. Our Legacy News blog, now in its 10th year, is one of the longest-running genealogy blogs online. Here's a look at the top 10 posts of 2015. I decided I needed to revisit the information about the 1810 census document. I hadn't really looked at it in years. Other than Christina, I couldn't really remember what information was in the record. This time, instead of using a timeline of one ancestor's entire life I created a new twist on the format. Instead what I did was I took multiple people and looked at one moment in time. My goal was to create a flashpoint for the year 1810 in order to try to determine where Christina and all her seven children were in 1810. Interestingly enough this quest opened up new questions and more mysteries! How to create a family calendar. How to see who else shares your birthday or anniversary. How to create a list of birthdays for any month. If you have been following along with my previous blog posts - 10 Easy Steps to Organizing Family Photos Part I and Part II - you are ready to begin scanning, preserving and sharing those wonderful family photos you just organized. 7. This Age At Death ALMOST fooled me! Without reading ahead, can you guess this age at death? Although this is from a Swedish parish register, the numbers are pretty clear. And you probably don't need this clue, but age at death in any record I've seen, is usually written in this format - years, months, days. Genealogists love cemeteries! Cemeteries can be critical for finding information related to the births and deaths of our ancestors. When there is a lack of records sometimes the only information we have will be on a gravestone. In this article we'll discuss four ways you can expand your cemetery research. 2. Did FamilySearch really "lose all their records"? "Dad, I think FamilySearch lost all their records!" Earlier Ancestry.com announced in this blog post that they will discontinue their Family Tree Maker software effective December 31, 2015. 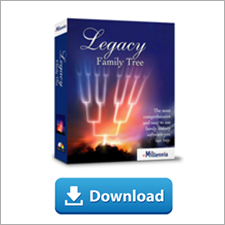 We know this change is difficult (my very first genealogy software purchase was FTM...), yet know that you will enjoy Legacy Family Tree. Millions have already downloaded it. Subscribe to the mailing list here. Follow us on Facebook here or on our Legacy User Group on Facebook here. Read updates directly in your Legacy software. Just click on the Legacy Home tab. With the new year approaching, why not resolve to be a better relative by remembering family birthdays and anniversaries? With Legacy open, click on the Reports tab, then the Other Reports button, then the Calendar Creator. Instead of including all 20,000+ individuals on my calendar, I selected to include "Only Tagged Living Individuals" (found on the Include tab). I previously "tagged" the descendants of my grandparents and my wife's parents so as to only include those closely related to me. Please see 10 Steps to Scanning, Preserving and Sharing Your Photos (Part 1) for the first three steps in this project to scan your precious family photographs. There are different types of scanners available. Some are better for photographs, and some for documents. Some are wonderful for taking on trips or using while sitting on your sofa, while others are best on your desk beside your computer. You want to be sure you are using the right one to scan those precious family photos you recently organized. Flatbed scanners can scan different sizes of photographs. These scanners allow you to scan more than one photo at a time, then crop the main image into individual files later. For options see Flatbed Scanners - Which One is Right for You? There are portable flatbed scanners such as the Flip-Pal which is best for photos no larger than 4x6”. I love the Flip-Pal but it is a personal choice. View this free video class on the Flip-Pal - New Genealogy Technology: Flip-Pal Mobile Scanner in the Legacy library. There are also handheld scanners available. If you are happy with the scanner you have, check to see if you can change your settings to the preferred format (.tif or .png) and resolution (600 dpi or 300 dpi). There are apps that allow you to use your cell phone as a portable handheld scanner. These are very handy if you are out a library or archives and don’t have any other method of capturing an image but I can’t recommend them for scanning your treasured family photos. It’s a good idea to clean your scanner bed with a dry cloth like the kind you clean your eyeglasses with. You will probably want to wipe it down every so often if you are scanning lots of photos. Don’t use liquid to clean the bed. You’re almost ready to start scanning but there are a few more decisions to be made. Once you are ready to scan, I suggest scanning one sorted box of photos at a time, scanning them and transferring them to your computer before you continue with a second box. As you complete each batch of scanning, you will probably also want to rename your files from the file name assigned by your scanner. Underscores are often illegible when viewing in a URL in a browser, or even when typing out or printing a local file path. It’s also not adviseable to put spaces between words. I do not use any upper case in the file names but that’s a personal choice. Metadata is data describing context, content and structure of documents. With each document you can add metadata which includes words and properties to a document to help search for it in the future. I add the details and the source in my metadata. One way to add metadata is to use a directory program such as Windows Explorer. Find an image file then click only once on the image. On the bottom of your screen you will see various metadata fields such as author, subject, tags, etc. Click the fields to add your information. Photo editing programs such as Adobe Photoshop Elements and Adobe Lightroom have built in functionality to help you add metadata. This is a photo of the Guelph Lumber Company Picnic. The Guelph Museum sent a copy of this photo to me but they did not know the year or who any of the individuals were. But I recognized my grandfather, grandmother, mother and aunt. Based on the estimate of my mother’s age I calculated the approximate year the photo was taken. So I added that info to the metadata. * Cloud storage such as Dropbox, Bitcasa, iDrive, Amazon Cloud, Google Drive, etc. * Create a Photo Book through an online self-publishing service such as Shutterfly. You can publish copies for family members and keep one for yourself. Personally I do all of the above except burning my files to a CD Rom. I do not recommend a flash or thumb drive for storage backup as these devices are meant for temporary storage, not permanent storage of files. Whichever method(s) you choose, remember that technology changes very rapidly and if you choose the CD Rom for example, eventually it will not be viewable by anyone or it will degrade. That is why my motto is to never put all my eggs in one basket! I don’t recommend cropping out backgrounds or the original edging of an older photograph. Even though Aunt Edna may be a tiny figure surrounded by houses, lamp poles, and sidewalk, if you crop the photo to show just Aunt Edna, you lose any historical or personal significance to the photo. You lose clues – perhaps one of those houses in the background is your great-grandmother’s house! I do straighten an image if it scanned at an angle. If I am going to adjust the colour (Darken, lighten, etc) or do any editing of the actual photo, I save the original scanned image and work only on a copy. Example of some of the family books I have created to share and preserve my family photographs. Don’t let what is probably a large project overwhelm you. Break it into smaller chunks. Only scan one box or one pile of photos at a time. Scan a bit every day rather than spending hours and making mistakes or exhausting yourself. Make it fun! Enjoy looking at your wonderful memories. You will be so proud of yourself when you finish and you’ll no doubt feel relief that not only have you preserved your precious family photographs but you can easily share them with others. Be sure to see "Digital Images for Genealogists and Technologists: Scanning, Organizing, Editing, and Sharing Your Digital Images" by Geoff Rasmussen in the Legacy Webinar Library. You can also check out the Digital Imaging Essentials book by Geoff Rasmussen. If you have ancestors from Canada, head straight for the Legacy Family Tree Webinars Library! With the addition of three new webinars, Legacy now has seven classes to help you locate your Canadian ancestors. We're working hard to give our webinar subscribers the educational classes they need to maximize their genealogical research! All three of these new classes are bonus webinars in the Legacy library. The webinar previews are always free. Did your parents, grandparents or great-grandparents live most of their lives in 20th century Canada? Finding information after 1939 can be tricky but there are resources available if you know where to look. Discover how you can add the missing details to the lives of your 20th century ancestors and relatives. Library and Archives Canada website is an excellent resource for genealogists but it can be confusing to find what you’re looking for. Learn how to get the maximum benefit of the free online databases, discover strategies to get results and explore new collections. For seventy years (1869-1939) over 100,000 destitute children were sent from British streets and orphanages to Canada to become domestic help and farm hands. With over fifty sending agencies, these children were primarily placed in Nova Scotia, New Brunswick, Québec, Ontario, Manitoba, among other locations. One in ten Canadian’s are now descendants of Home Children. This program is an unknown piece of relatively recent history in Canada. We will learn about the program itself, and how to go about locating records and identifying if an ancestor was British Home Child sent to Canada. Act today to claim your gifts from Legacy! 1. Give a gift and claim your own! Purchase a $50 Legacy e-Gift Card for your loved one and receive a coupon code in the amount of $10 for you to use with your next purchase in the Legacy Family Tree Webinars store. While your loved one is getting settled into their new software by watching free Legacy training videos, you can decide how you'll spend your $10 gift! Perhaps you'll want to put it towards a new Flip-Pal scanner or a Legacy Family Tree Webinars monthly or annual membership. Maybe you'd like to stock up on a few Legacy QuickGuides. The best part is you get to decide! Act fast, this offer expires at midnight on Thursday, December 24, 2015! 2. 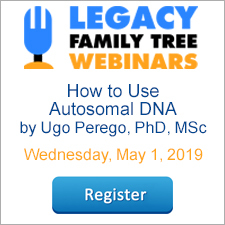 Enjoy a Legacy Family Tree Webinar on Us! We've opened up the library and made one of our favorite members-only videos available to the public for the holiday weekend. From now through Sunday, December 27, 2015 you can watch Digital Images for Genealogists and Technologists: Scanning, Organizing, Editing, and Sharing Your Digital Images by Geoff Rasmussen for free! This is our way of saying "Thank You" for being a Legacy Family Tree customer and community member! I'll give myself a little leeway for overlooking it, for I was a beginning, inexperienced researcher at the time. But if I hadn't been careful with the rest of my research the results could have been disastrous. Inspired by Mark Lowe's most recent webinar I decided to give the research of my 6th great-grandfather, John McCall, another shot. Knowing that researching backwards (from the end of the ancestor's life) is often good genealogical methodology, I opened up his Individual's Information screen in Legacy and focused on his will. I clicked on the Will event and clicked the Edit button to view the will's transcription I had made years ago. I was looking specifically for the names of any friends, associates, or neighbors (otherwise referred to as the FAN club). Since John's origins have been difficult to trace, I would begin to study the lives of those around him. If I can learn where they came from, perhaps it would help me learn where John came from too. In the transcription I noticed that there were several words that were represented with --- indicating to me that at the time I made the transcription I was unable to decipher the handwriting. I then noticed that the Media Gallery button was still black/white. In Legacy this is an indication that I've not yet linked a picture to the event. The photocopy of the microfilmed will was still there, but was of such poor quality that I really needed to see the original again. FamilySearch's Historical Record Collections appeared to have these records online now. Pretty quickly I found John's will. Wow. All of this took just minutes. What a different experience this is today compared to when I originally looked for his will. Did you notice what was missing from my transcription? Senior. This 6-letter word is a big deal. It infers that there is more than one John McCall. While it usually means that this person had a son of the same name, it could also mean there were two John McCalls in town, and this was the elder of the two. Regardless, omitting that word from my transcription is kind of important. Thankfully I've already studied the entire community to identify all McCalls in the area and have learned there are only two Johns - the John who authored this will, and his son. What does this teach us? First, while there is a place in our research for referring to abstracts or transcriptions, we should always try to consult the original record. Second, take another at your documents. I'm a better researcher today than I was back then. I'm going to see things today with fresh and experienced eyes. You might even have someone else take a look at your ancestor's documents - they might see something you've overlooked. There may be new clues in the records you already have. Learn more genealogy methodology from genealogy's experts at www.FamilyTreeWebinars.com. We've got at least these 10 webinars in the library that will help you see your records with fresh, experienced eyes. I write up case studies and proof arguments using MS Word. I also have a One-Name Study and using Excel spreadsheets to analyze my data is very important. I link these documents to Legacy's Media Gallery (which media gallery depends on what the data is). I can open the Media Gallery, double click on the linked document, and the document will open and I can edit it. When I am done I simply close the document and the Media Gallery automatically has the most current version (Legacy links to the documents, it doesn't embed them). This saves me time because I never have to leave Legacy to open Word or Excel separately. It is important to me to keep all my genealogy information accessible in one program, Legacy. There are individual media galleries, marriage media galleries, media galleries for locations, sources, source detail, mailing addresses, event addresses, repository addresses, and To-Do tasks. For example, you can find a media gallery easily by looking at either the husband or the wife profile. See the media gallery highlighted with the red box below. When they gallery contains media the icon becomes colored. The different types of media will have different icons. The icon above is for documents.